If you love puzzles and riddles and solving clues to figure out secret plots, then an escape room is for you. An extension of the video-style escape games, these happen in real time with real people in theatre-like settings. The clock is ticking! Here are the 10 best escape rooms in New Mexico. Do you have what it takes to escape? Here are some rooms that test your best problem-solving skills. 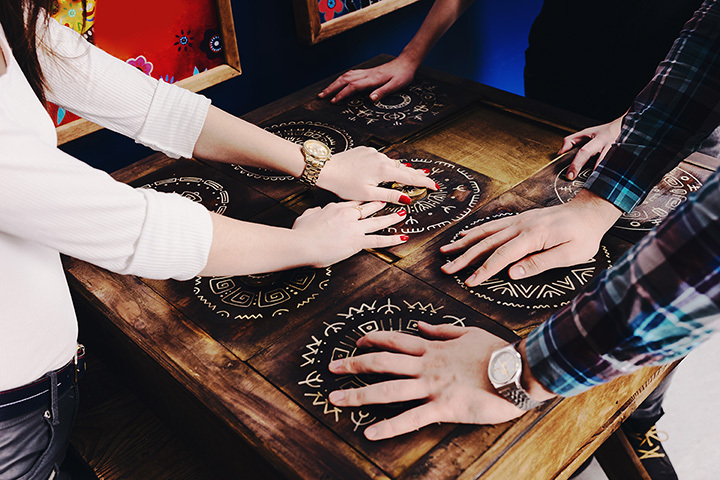 This immersive physical experience brings family or friends or co-workers together to figure out all the secrets, find the hidden clues, solve puzzles and open locks, all before time runs out. Three different themed rooms—Quest for the Throne, Aunt Elna’s Inheritance, and Carat Capers. All take about an hour and accommodate two to six players. Reservations required. The state’s first escape room knows a thing or two about creating an exciting and perilous exploit. Choose from four unique experiences—catch a serial killer in the Cabin, channel tomb robbers in Nefertari’s Tomb, engage in a Duel at Dusk and find the Family Jewel. Chances of getting out in 60 minutes improve if everyone works together to connect all the clues. Group maximum is eight. Booking must be made in advance. Put your skills to the test in one of three heart-pumping mystery challenges that are just like being inside a book or movie, except all the action is happening in real time. Time is of the essence. Quick decisions must be made. Logic, dexterity, and ingenuity are what count to beat the clock, find the exit and get out. Watch out for the mob, not the one you’re with, in Fredo’s L’ultima Cena. Beware the pharaoh in Lost in the Tomb. Go on a spy mission in Situation Critical. Online booking available. The secrets of the Roswell incident are front and center in the escapades at the escape rooms here. Who knows where the threat is from…it may even be otherworldly. With four unique occurrences to unravel, each room brings different cryptic puzzles and clues. Begin in the Source, watch out in BioHazard, beware in Hard Times and keep your eyes open in Revelations. A fun time with family, friends, teams, work groups and strangers, of this world or any other. Each room accommodates two to eight players. Book online. You’ll find four original rooms that challenge the best of puzzlers. This is not like figuring out that Col. Mustard was the culprit in the study. These are abstract stumpers that test every ounce of your intuitive thinking. Whether you go it alone or at a birthday party, graduation, baby shower, retirement party or just because you’re bored, these four challenging games are full of problems to solve. Can you escape? In 60 minutes? With your sanity intact? That’s the goal. All you have to do is figure out some mind-bending puzzles, keep your wits about you and work as a team to complete a thrilling escape. Find out the truth about the 1947 Roswell incident in Alien or grab your trench coat for some cloak and dagger intrigue in Deep Sky or set sail on a pirate adventure in Stowed Away. Sign up online. It all starts with getting arrested. From there, you have to figure out how to get out of jail, a jail that the infamous outlaw Billy the Kid never escaped from. Secret passages, hidden rooms, troublesome riddles, and amazing special effects make escape all but impossible. But where there’s a will there’s a way and you have but one hour to find it. Great for adults as well as young people aged 14 and older. Children under the age of 14 must be accompanied by an adult. Unleash your inner detective to break out of the two escape rooms at this business designed and owned by a young, entrepreneurial woman who loves a good horror story. She wrote the script for Hambone’s Basement, about a cannibalistic serial killer, as well as Nuclear Laboratory, where gamers are fighting the effects of a deadly chemical. Open Thursday through Sunday and by appointment only on other days. For the ultimate team building experience or birthday party or special event, lock yourself in a room with a group of people who you have to depend on to get out in these live, interactive games. It takes your best deductive reasoning to find the hidden clues, solve puzzles, and unlock secrets to emerge 60 minutes later. Choose from the creepy Camp Crystal Lake, the mysterious Da Vinci’s Secret or the heartwarming North Pole Challenge. Call, email or book online. The brains behind these adventures became so obsessed with escape rooms they created two to share their enthusiasm with others. With a team of six or just as a pair, participants are thrust into an interactive, entertaining, mind-bending experience in a search for hidden objects and clues that leads to the solution…getting out of the room. The clock starts ticking the minute you enter and 3,600 seconds later the jig is up. Reserve by phone, email or online.